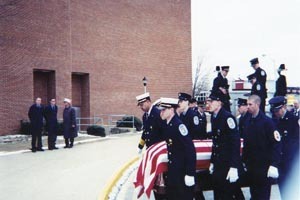 Full Departmental Honors and Funeral Services were held at 2:30 P.M., Saturday, Janauary 25, 2003, at the Shippensburg Senior High School. 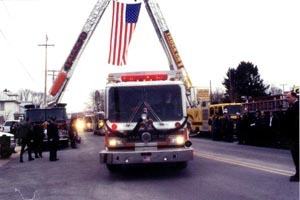 After the service, a procession of firefighting equipment moved east on West King Street to Lurgan Avenue, where it passed West End's station and through an arch formed by ladder trucks from Cumberland Valley Hose Company, Cumberland County, Company 53 and Chambersburg Fire Department, Franklin County Company 1. 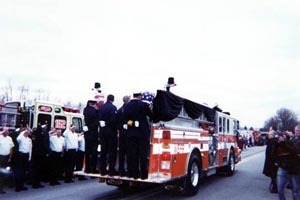 The procession then entered the cemetery from Roxbury Road through another arch formed by ladder trucks from Franklins, Franklin County, Station 4 and Mount Holly Springs, Cumberland County, Company 36. 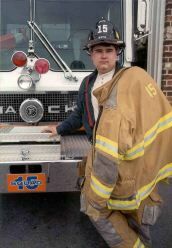 All pictures were taken by Denny Clopper, PIO, West End Fire & Rescue Co. 15. 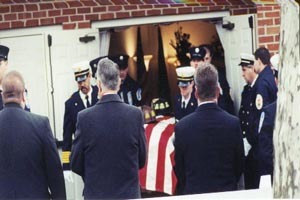 Pallbearers carry the casket of Lt. Keith Hess from the doors of the funeral home. 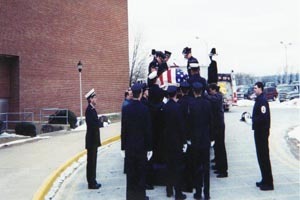 Pallbearers load the casket of Lt. Keith Hess onto Engine 15-1. 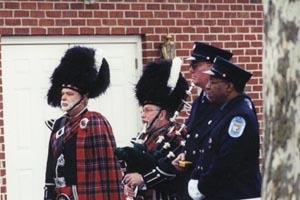 Co 15 members, Bob Rohr and Charles Westcott in dress uniforms stand next to the bag pipers. 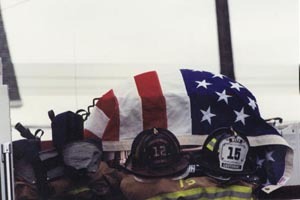 The casket draped with the American Flag and the two helmets that he wore at Co 15 and Co 12. 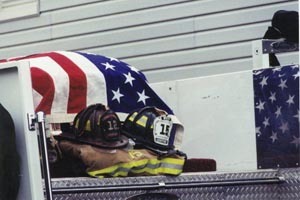 Two helmets and fire gear of the late Lt. Keith Hess lie in front of the draped casket. 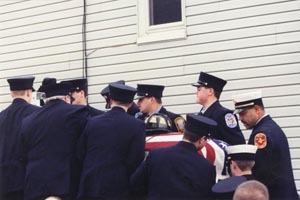 Pallbearers prepare to unload the casket as Chief 15, Randy O'Donnell far left and Chief 12A, Steve Sites far right hold the helmets of the departments he wore. Pallbearers unload the casket from Eng. 15-1 at the Shippensburg High School where the departmental ceremonies were held. 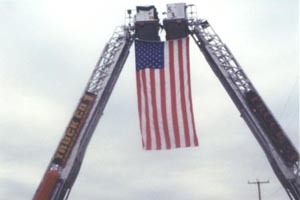 The arch in front of Co 15 West End Fire & Rescue Truck 1 Chambersburg Fire Dept Left Truck 53 Cumberland Valley Fire Department right American Flag hangs in the middle. Engine 15-1 passes under the arch in front of Co 15 with the casket of Lt. Keith Hess as fellow firefighters from CO 52 render hand salutes. Co 12, Fannett Mental Ambulance passes under the arch in front of Co 15, an ambulance which Keith Hess drove when he was at work. 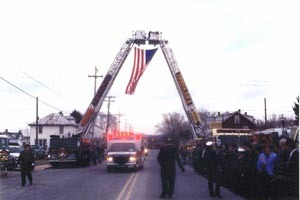 The arch formed at the entrance to the cemetary to the final resting place Truck 36 Mt. 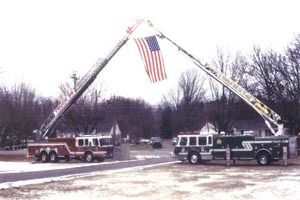 Holly Springs left Truck 42 Franklin Fire Company Chambersburg right as the American Flag hangs in the middle. Sunbury,Pa. Squad 552 passes under arch and prepares to park in front of Co 15. This squad was previously owned by Co 15. 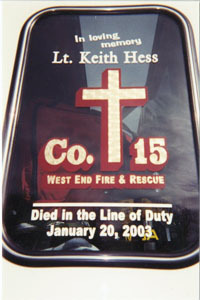 It was an uplift for Co 15 members to have the Friendship Fire Department, old Squad 15, and memories of Keith Hess in the squad in which he rode. A message on the side window of Engine 49 Walnut Bottom Vol. Fire Department upon arrival of the funeral ceremony. 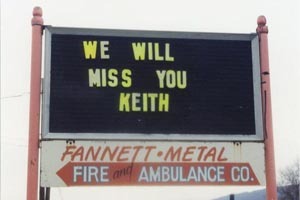 A message on a sign just up the street from Co 12 station Fannett-Metal were he was employed as an paid emt-firefighter. 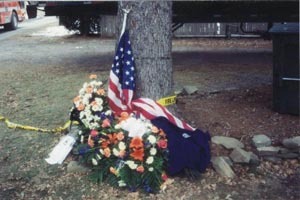 American Flag,Flowers,Company tee shirt and poem at the fire scene site which were placed by Co 15 members the day after the funeral on Sunday,1/26/03as a way for all to pay their additional final respects to their late brother and family friend.